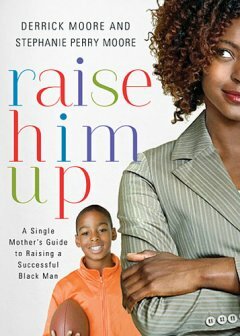 In Raise Him Up: A Single Mother’s Guide to Raising a Successful Black Man (2013), Stephanie Perry Moore offers the reader some personal insights about the struggles single black women face rearing successful black boys who develop into men. Extensive research has empirically proven that black male students academically lag behind all of their peers throughout every level of education. The narratives of single black women who rear black boys receive limited focus in the professional literature. This book, therefore, provides a needed account of the challenges and problems encountered by single black women rearing black boys, especially their efforts to rear successful black boys who evolve into successful black men. Moore contends that using spiritual instruction and guidance available in the bible is essential to producing successful black boys and men. The author relies heavily on the Book of Acts to support her suggestions and arguments. She gives the reader prayers they can use in their work with their black male child. One chapter is devoted to rearing a successful black male student-athlete. While the book offers important practical challenges and problems encountered by single black mothers rearing black boys, Moore made a poor strategic choice of employing the Book of Acts as her primary source for biblical support for the things she suggested and asserted. The biblical support is simply forced throughout the work. The chapter on rearing a successful black male student-athlete appears tacked on and lacks adequate coverage. The chapter on rearing a successful black male student-athlete would have been better as a separate, standalone project. Overall, the book leaves much more to be desired. This book is a classic case of a good idea not executed well. During the review process of this book, someone should have made a compelling case to Moore to buttress her biblical support for her arguments and advice by choosing more relevant scriptures to enhance her arguments and advice. Although there are some nice qualities about the book, I cannot highly recommend the book because of its many failures. BookLook Bloggers gave me a complimentary copy of the book to compose a professional review of it.